One of the most frustrating things we see and get asked about all the time is the topic of one access point per classroom. For many K-12 schools, this is the strategy or WLAN design they were sold on, and while it may seem to make sense, in reality it's not needed and it's not correct. In this month's Whiteboard Wednesday, Michael McNamee (Senior Network Engineer) discusses the four main reasons why one access point per classroom is NOT a universal solution. Hi, everyone. My name is Michael McNamee. I'm a senior network engineer here at SecurEdge Networks. 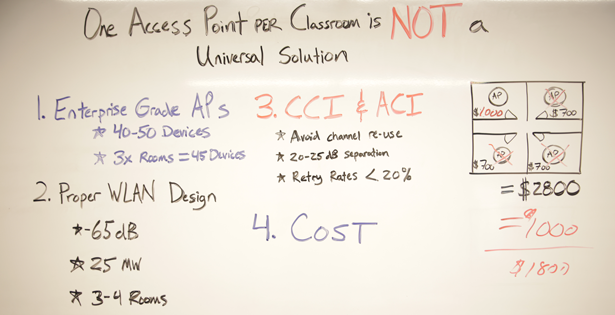 Today's topic for our Whiteboard session is why one AP per classroom is not the universal solution. The first reason is if you're using enterprise grade APs, they are fully capable of handling 40 to 50 devices at a time without any issue. And if you think about a K-12 environment, if we've got three rooms with about 30 students or 30 devices per room. That's really only going to give us about 45 devices actually connected. You're gonna question my math on that. Hear me out. In the real world, we're never seeing 100% of the client devices connected at any one time. We're only seeing about 50%. 50% would net us about 45 devices connected to the wireless LAN. So that's well within the 40 to 50 devices that the AP can handle without issue. 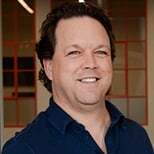 Now, those devices are connected, they're not actively through-putting or consuming bandwidth on the wireless LAN. In the real world, what we're seeing is about 40% actively through-putting out the system. So that puts us somewhere in the range of about 30 to 35 devices actually through-putting on the system which is still under the 40 to 50 devices that AP can handle without an issue. Another reason that I want to discuss why one access point per classroom is not a universal solution is doing a proper wireless LAN design. An enterprise grade AP has no problem getting -65 dB to a client device in a classroom. With the AP set at 25 milliwatt, which is a symmetrical power setting to, say, an iPad or Chromebook, or some sort of tablet type device. And that same AP can cover three to four classrooms with good signal, depending on what the construction materials are. In most K-12 environments, it's gonna be drywall with stud construction or potentially even cinder-block, but the AP has no trouble with that. So having the proper wireless LAN design implemented just further validates why you don't have to have one AP per classroom. So, reason number three that I want to talk about is CCI and ACI, which stand for co-channel interference and adjacent channel interference. In designing wireless LAN, we want to avoid channel reuse as much as possible. We also want to keep at least 20 to 25 dB of separation between our channels, and we want to keep our retry rates less than 20%. Even with enterprise grade APs, it's gonna be very difficult to achieve all these bullet points. It really is an example of too much of a good thing is a bad thing. And reason four we have is cost. Cost is a big factor. Everybody's concerned about cost. If a solution provider or a re-seller comes in and does a one AP per classroom design, they're gonna propose a mid-level AP which lists about $700. If we've got four classrooms with $700 APs, we're looking at a cost of $2,800. If we do what we propose, which is proper, we don't need these other three APs. We have one AP, and we do a higher end AP that's $1,000. We now have a project cost for these four classrooms of $1,000, which is an $1,800 savings. That's a big savings. So we get better cost, and we get better performance from the system.